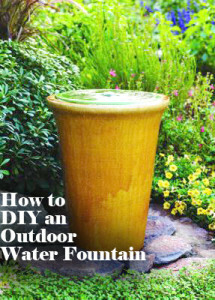 The soft trickle of a water fountain on a patio or near your favorite chair in the garden can soothe away the cares of any day. I LOVE the sound of trickling water and with all the easy DIY design options out there, there’s no reason not to have one. You are only limited by your imagination…..and an electrical hook-up; which, by the way, is a much over-looked and very important component when designing your fountain. Fountains can be as simple or as complex as you choose to make it. Let’s take a look at a simple pot-in-pot fountain. I love this one featured in a Sunset magazine. 1. Dig a hole in the soil deep enough to hold the plastic bucket. Using tin snips or a drill, create a ½-in. notch in the bucket rim. Put the bucket into the hole with its rim at ground level and the notch facing your electrical outlet. Set the pump in the bucket. 2. Using tin snips, cut a square opening (about ½ in. across) in the center of the steel mesh. 3. Attach the plastic tube to the pump and thread it through the center opening in the steel mesh. Position the mesh square atop the bucket. Pull out the free end of the pump’s power cord; position so it exits the bucket through the cut notch. 4. Slide the plastic tubing’s free end through the drain hole of the large pot. 5. Center the large pot atop the steel mesh while guiding the tubing up through the drain hole. 6. Squirt a bead of silicone caulking around the upper inside of the outer pot. Place the shallow pot into the larger one, while guiding the tubing up through the drain hole. Make sure the inner pot makes a good snug fit with the caulking. Trim the top of the tube so that its end is flush with the bottom of the shallow pot. Allow the caulking to dry overnight. 7. Put landscaping stones around the pot to hide the mesh. One word of caution. The water will evaporate more quickly than you may think. Check the bucket often to make sure there is enough water to cover the pump. Otherwise, you may be buying a new pump.